We are working on the branding and corporate styling for GEW. This is part of a series of new projects we have completed, below is the design for a Table Top Display for the FINAT Exhibition in Monte Carlo. FINAT is the world-wide association for manufacturers of self-adhesive labels. It was founded in Paris in 1958, and since then has been representing the whole self-adhesive supply chain. GEW is a world-leading manufacturer of the most powerful low-energy UV curing systems. They have developed an excellent reputation as a supplier of UV drying systems for printing applications, including flexo, offset, letterpress, gravure, silkscreen and UV inkjet. We also have considerable expertise in the UV coating sector, including inert gas atmosphere curing solutions for siliconising, packaging and many other processes. FINAT is the European Association for the self-adhesive label industry. It also covers adjacent narrow-web product decoration and identification technologies. The FINAT Board embarked on a strategic planning journey. This journey was broken down into different stages and concluded with a detailed roadmap aimed to reach 6 strategic ambitions for the coming years. FINAT (a abbreviation of the French title: Féderation Internationale des fabricants et transformateurs d’Adhésifs et Thermocollants sur papiers et autres supports) is all about labels and people. In 2008 FINAT celebrated its 50th anniversary, its Golden jubilee. Building on the success of the Coal and Steel Treaty, six countries expanded cooperation to other economic sectors. In 1957, Germany, France, Italy and the Benelux countries signed the Treaty of Rome, creating the European Economic Community (EEC), or ‘common market’. The idea was for people, goods and services to move freely across borders. One of the objectives of the Treaty was to transform the conditions of trade and manufacture in the territory of the Community. The Treaty set the scene for further cross-border cooperation at sector level and this culminated in the foundation of various European associations in subsequent years. On the initiative of the French label association, at the time the only national label association in Europe, and in particular André Strauss, a group of 20 companies got together in Paris to lay the foundations for an international association dedicated to the label sector. FINAT was officially founded in November 1958. 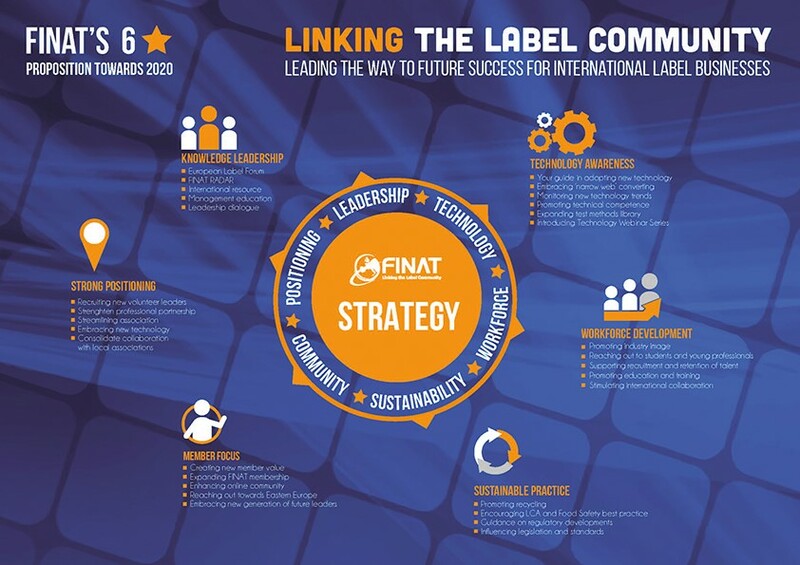 The full success story of FINAT can be found in the publication ‘United in Labels’ which was published on the occasion of our 50th anniversary in 2008. Contact the Secretariat in case you wish to receive a copy. Turquoise Creative are proud to have provided GEW with a fresh design approach for their exhibition in Munich this week. The FESPA Digital Show is one of the largest focused events for Digital Wide Format Print. The Munich Exhibition Centre staged 400+ innovative global brands and manufacturers. The visitors had the opportunity to view new product launches, test drive machinery and technology to service the print market. FESPA Global Print Expo 2019 is expected to cover six halls of the Munich Messe, Germany and will showcase the latest products and solutions for screen, digital and textile print. FESPA Global Print Expo 2019 will again be co-located with European Sign Expo for non-printed visual communication solutions. FESPA Exhibitions Director Roz Guarnori commented: “FESPA 2018 Global Print Expo was a vibrant, action-packed event that absolutely surpassed even our own expectations, from the energy and appetite for innovation among our diverse visitor audience to the incredible range of new products brought to market by our exhibitors. Our own research and the electric mood of the show reinforce our confidence that speciality print and signage are sectors that never stop inventing, exploring, pushing boundaries and looking for new ways to achieve growth.”.